Last night I performed a network upgrade, replacing an old and potentially failing 3Com 3848, with a Dell PowerConnect 5548. The network design that my head office has leaves a lot to be desired, but unfortunately I don’t have the resources to do a complete overhaul. Right now we’ve got a single core switch, which is linked to our Sonicwall NSA 2400 by one switch port. 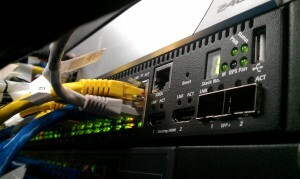 Every other access switch, and all servers directly connect to this core switch. Almost everything is using 2 port Link Aggregation when it makes it’s connection to the core. There’s zero daisy chaining of switches, and since everything connects directly to the core, I’ve got STP off on the core. Our access switches are mostly PowerConnect 2724’s anyways, so they don’t support STP. This is a very simple and effective network layout, but it’s far from redundant. If that core switch dies, our entire network is down, including every service we provide to external clients. My future goal is to replace the 2724’s with 2824’s that do support STP, and then instead of LAG groups to a single switch, I’ll use two uplinks to two separate core switches. The only thing that is currently beyond my knowledge is how to link those two core switches to our Sonicwall redundantly without creating a network loop or routing issues. Replacements like this are one of the high points of my job. It seems simple, basic and low on the skill requirements, but there’s something about meticulously planning and then implementing hardware that is very relaxing, very enjoyable. I don’t know if others share this sentiment, but racking things is definitely a job perk that I wouldn’t want to give up. I agree with your last comment “there’s something about meticulously planning and then implementing hardware that is very relaxing, very enjoyable”. Over the last year one of my larger clients has had ALOT of attention given to its network structure, going from a very basic one subnet daisy chained design to a fully overhauled tripple subnet (client, storage, server) and VLAN’d network. Thanks for the comment Andrew. Looks like the powers-that-be are going to approve the recommendation of moving our servers out from below a washroom, so I’ll have much more of this in 2012 I think. I bet I wouldn’t be so excited if I didn’t have the Dell RapidRails though. So much nicer than what our APC units sit on, that’s for sure.